As an input, each PFI terminal can be used to supply an external source for DO timing signals or counter/timer edge or level polarity selection. As a PFI output, you can route many different internal DI or DO timing signals to each PFI terminal. 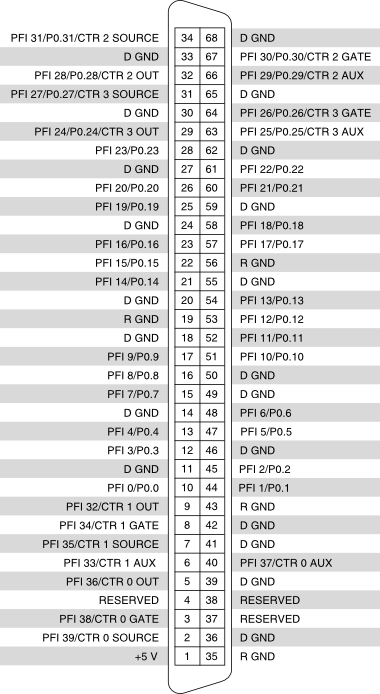 You can also route certain counter/timer outputs to PFI <24..31> terminals.. As a port 0 digital I/O signal, you can individually configure each signal as an input or output. Programmable Function Interface—As an input, each PFI terminal can be used to route an external source for DO timing signals or counter/timer edge or level polarity selection. As a PFI output, you can route many different internal DI or DO timing signals to each PFI terminal. You can also route certain counter/timer outputs to these terminals. +5 V Power Source—These pins provide +5 V power. Restricted Ground—Tied to D GND. These terminals are routed to RESERVED when using the product with a SH68-68-D1 shielded cable or routed to D GND when using the product with a R6868 ribbon cable. Digital Ground—These terminals supply the reference for the PFI and digital signals at the I/O connector and the +5 VDC supply.